eDocEngine has "report-export interface components" for providing multiple output format support for Delphi reporting tools. For Fast Report, eDocEngine has the TgtFRExportInterface interface component. You can either let the end-user of the Fast Report application to choose the output provided by eDocEngine in an interactive report "Save" dialog box or you could export the report programmatically in Object Pascal. 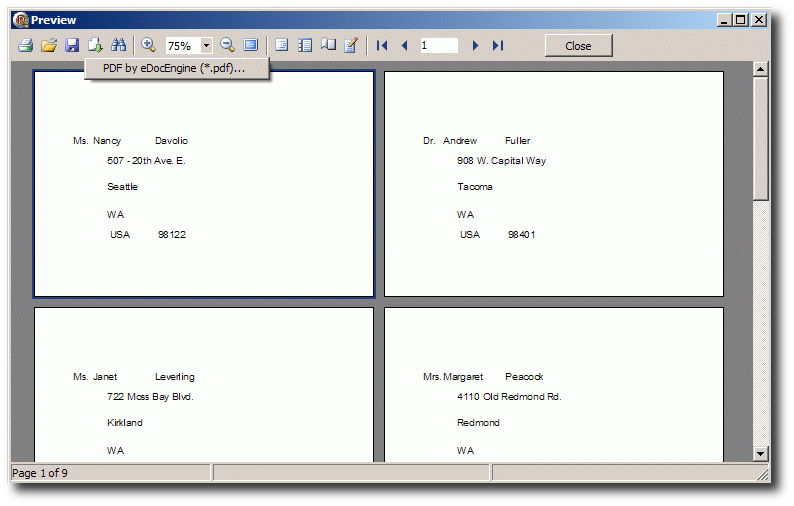 On an application built with Fast Reporter, an instance of this interface component needs to be paired up with an eDocEngine document-creation engine component. For example, to output a Fast Report report to a PDF document, a TgtFRExportInterface instance needs to be paired with a TgtPDFEngine instance on the same form as a TfrxReport. 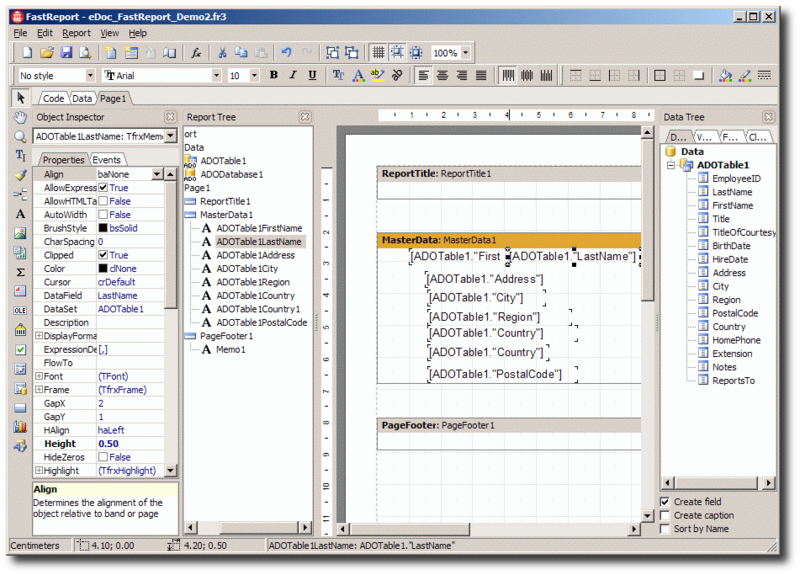 Create a VCL forms application in your IDE. From the FastReport category on the Tool Palette, add a TfrxReport component and a TfrxADOComponents component to the form. Set the Engine property of the TgtFRExportInterface component to the TgtPDFEngine component. Set the Description property of the TgtPDFEngine component to "PDF by eDocEngine". Add four TButton controls to the form. Double-click the TfrxReport control to load the designer and create a FastReport report. On the Report tree, select the Data icon. From the Objects toolbar, add a TfrxADODatabase component to the work space. 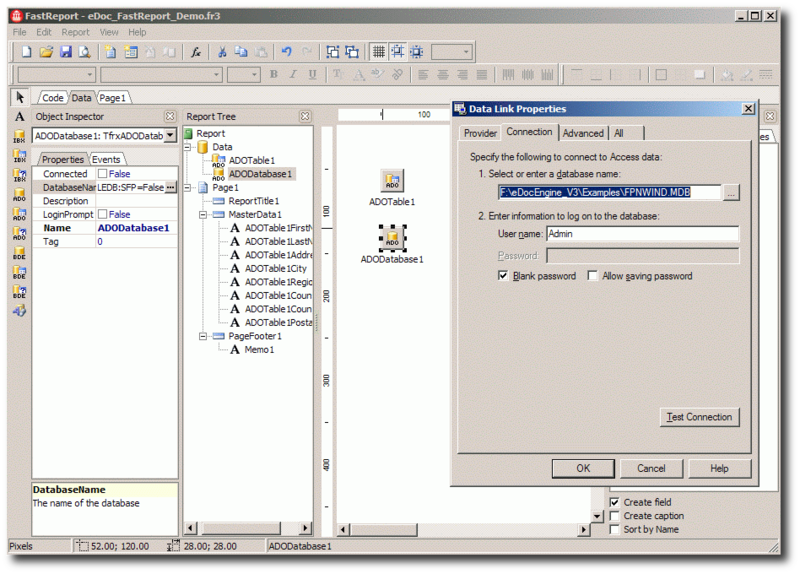 With the TfrxADODatabase control selected, set its Database property to, say, Access or SQLServer database. From the Objects toolbar, add a TfrxADOTable component to the work space. 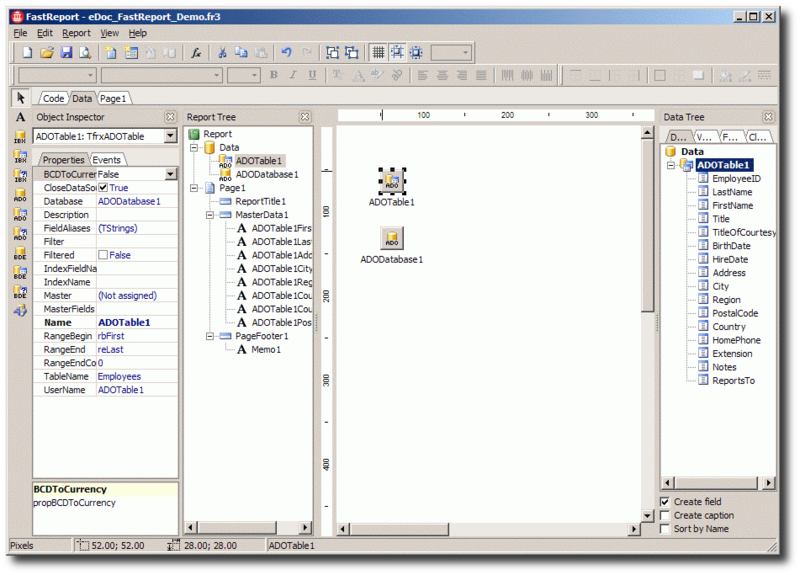 With the TfrxADOTable component selected, set the Database property to the TfrxADODatabase component. Set the TableName property to a table in the database. Note that the fields in the table are now listed on the Data Tree below the TfrxADODatabase component. On the Report tree, select a page and drop some fields on a Master Data band (TfrxMasterData) on a page. With the Master Data band selected, set its DataSet property on the Object Inspector to the TfrxADODatabase component. 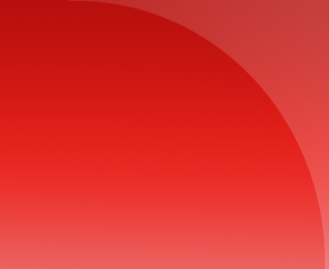 Save the report with file name "eDoc_FastReport_Demo.fr3". Preview the report and save the prepared report to a file named "eDoc_FastReport_Demo.fp3". Double-click the buttons and add these click-event handlers. Run the project and click either of the first two buttons to launch the report preview. On the report preview window, click the Export button and select the PDF by eDocEngine option. When eDocEngine takes over, save the PDF document somewhere and close the preview window. Click on one of the last two buttons for a completely automated report export.